The lights are on. The decorations are up. The music is swinging. Christmas is coming. For the Christian, the celebration of Christ’s birth begins not on December 25th, but commences four Sundays before. Called the Advent month, for four Sundays, pulpits around the world will be preaching sermons about Christmas and the birth of Christ. It is a happy event, a joyous celebration of God born a baby and also a king. 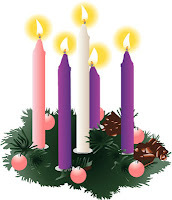 Christmas Eve/Day - We light all the Candles above + the Candle of Christ. We use different colours to represent the candles. For hope, peace, and joy, we use purple to symbolize Christ’s royalty as King. For love, we use the rose or pink coloured candle to represent Christ’s love and faithfulness. For the Christ candle, white is used to symbolize purity. He is right. Too many Christians have been observing secular events more than their own events. For that matter, Sunday is in a sense ‘secular’ as the day has often been attributed to the pagan sun-god during the time of Constantine. In 321 AD, after the Roman Emperor Constantine converted to Christianity, the day “Sunday” became the day where work is stopped and leisure began. That is why there is often a confusion among some Christians and Jews on when actually is the Sabbath. Is it still the traditional Friday/Saturday Jewish Sabbath or is Sunday the new “Sabbath” for Christians. For me, Sunday is essentially the Lord’s Day. The Sabbath is the Jewish day of rest. Christians are not compelled to observe any one specific day like the Jews to stop doing anything. They are strongly urged to take some form of a sabbatical rest as a way to remind themselves of their calling as participants of the Kingdom of God. Understood in this way, every day can have Sabbath moments. In other words, for Christians, last Sunday (Dec 2nd, 2012) is the start of the Christian New Year. I preached on the “Prophecy of True Light” on the first Advent Sunday, based on the text of Isaiah 9:1-7. In it, I lamented on the tragedy of Claus-mas, where our Western culture is increasingly more open and more embracing of all things Santa Claus, and more hostile and dismissive of the Person of Jesus Christ. From movies to songs, Christmas shopping to year end dancing, the big red costumed bearded men evokes more squeals and delights from both children and adults by society in general. Don’t get me wrong. I am not bashing Santa Claus. I am lamenting the diminishing platform for the Christ-child. People are fast getting rid of anything that is religious. A few years ago, one poor Christmas tree became the controversial tree to be removed from a Toronto courthouse simply because the judge feels that it is too “religious” for secular comfort. Light is a significant symbol during the Advent Season. Christ is the Light of the world. The people of Israel walking in darkness has seen a great light. This light has not only revealed itself, it has come to the people. The light is a coming glory, not a distant sight. It is a fulfilling prophecy, not just a fulfilled event in history. For the Advent is a remembrance of the light having come, the light has come, and a light that will be coming again. That is the significance of the Advent. My friends, how are you celebrating the Advent season? When we carve our Turkeys, or budget our money for Christmas shopping, remember why we are doing it. When we give toys and distribute gifts to the needy, remember in whose Name we are doing it for. When we send Christmas and holiday greetings to friends and loved ones, remember the reason for the season. Christ has come. Christ will come again. THOUGHT: Santa Claus may have been said to come into our homes through our chimneys. Whatever gifts this bubbly fat man gives is temporal. Christ comes into our lives through our hearts. Whatever gifts the Son of God gives will last through all eternity.